Lopburi (Thailand) (AFP) – A Thai district chief has clipped the wings of his town’s pigeon population by paying residents to trap the birds and organising a cook-off to build support for the cull. The campaign to go after hundreds of thousands of pigeons started earlier this week in a district of Lop Buri province – a region better known for its monkey menace. “The number of pigeons increases four to five times each year, if we don’t do anything the problem will get worse,” said Plaek Thepparak, the highest government official in Mueang district, who came up with the idea. The birds were a nuisance and defecated on government offices, historical sites, temples and houses while ravaging local crops, he added. “Before people can drink rain water but now they have to buy drinking water because rain water is dirty from bird droppings,” he said. Residents will get 10 baht (about $0.30) per trapped birds, which will be transferred to a quarantine centre in a nearby province. But cooking them up is also on the menu. “We also urged residents to eat the dead pigeons but only if they are hygienic and cook them well,” Plaek said, adding the town hosted a “pigeon menu” cooking competition earlier this week with cash prizes. The dishes whipped up included a simple fried pigeon, knocked back with a side of Thailand’s classic papaya salad. Two hours north of the capital Bangkok, Lop Buri is on Thailand’s tourist circuit and is better known as a haven for monkeys, but even they are being outnumbered by the birds. 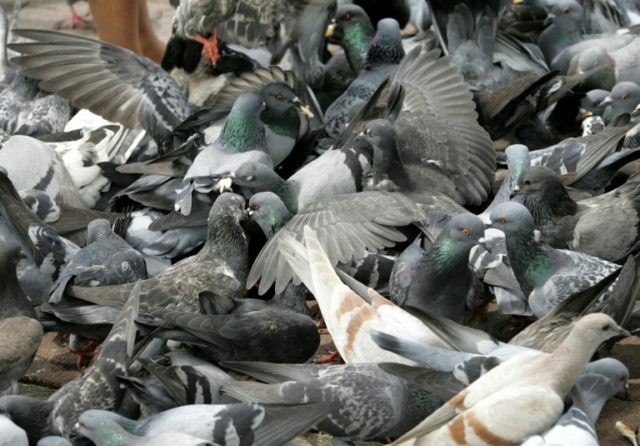 “There are about 3,000 monkeys but there are hundreds of thousands of pigeon,” Plaek said.